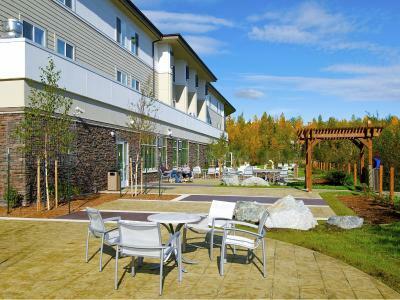 Lock in a great price for SpringHill Suites Anchorage University Lake – rated 9 by recent guests! 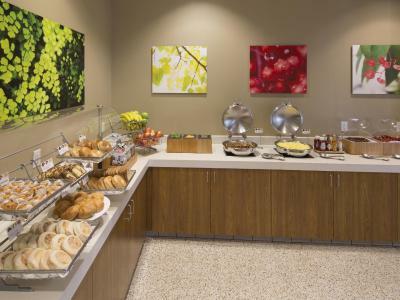 The breakfast was well supplied, the room was beautiful, quiet, and clean, and the staff was helpful and friendly. 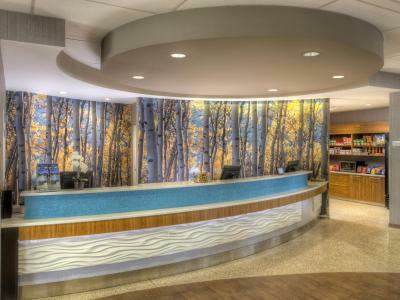 Front desk staff was awesome, rooms are beautiful and spacious. Bed was comfortable. Really like how the bathrooms are set up. 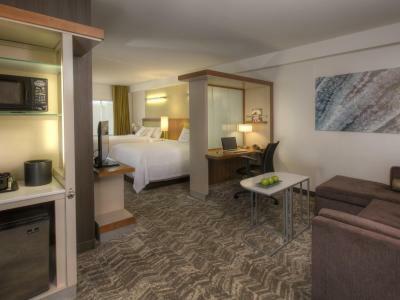 This is easily our favorite hotel in Anchorage and we have stayed there every time since we discovered it. Breakfast is awesome. Fireplace outside is nice. TVs with access to Netflix and Hulu is awesome. Love just about everything about this property. It’s always a nice friendly and clean place to stay. Great value too. Close to the hospitals and an easy trip to the valley. The room, location and breakfast was so good. My grandkids had fun swimming. Loved the comfortable property - spacious layout, best shower ever!, indirect light, great breakfast, luggage carts... Great location and staff. The male manager was very friendly, excellent customer services and tireless. He was very energetic and willing to assist customers. I stayed one week as Medicaid patient and the second week, I stayed there paying out of my pocket. 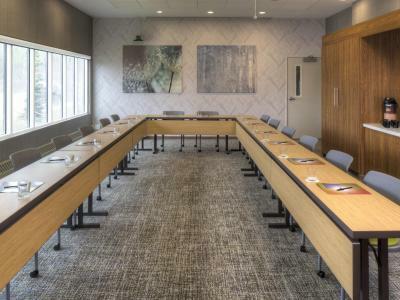 SpringHill Suites Anchorage University Lake This rating is a reflection of how the property compares to the industry standard when it comes to price, facilities and services available. It's based on a self-evaluation by the property. Use this rating to help choose your stay! Nestled at the base of Chugach Mountain Range, this hotel offers panoramic views of University Lake. 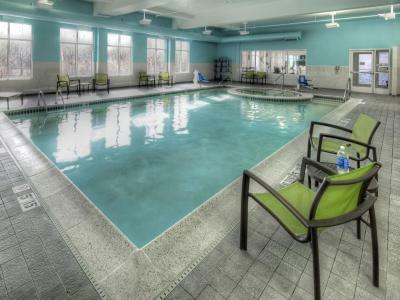 It features an indoor swimming pool and a hot tub. 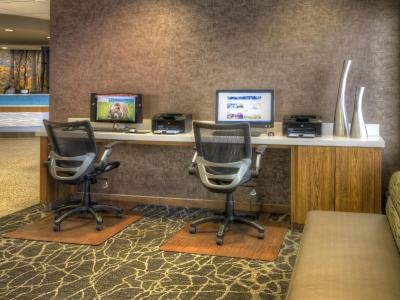 Each guest room provides complimentary WiFi. 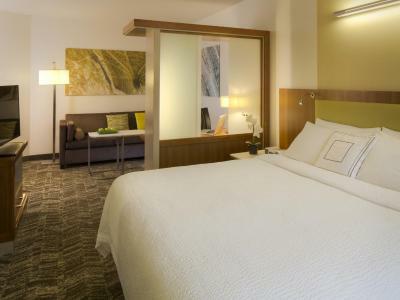 The spacious rooms are equipped with modern facilities including a flat-screen cable TV and air conditioning. A microwave and mini-refrigerator are provided in each room of SpringHill Suites Anchorage University Lake. 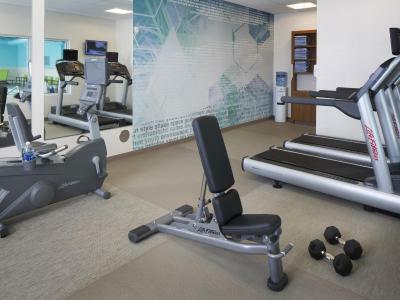 For guests that like to keep fit, SpringHill Suites Anchorage University Lake provides a well-equipped gym with cardio equipment and free weights. A shuttle service is provided to transport guests to and from the airport. Free public parking is available at the hotel. 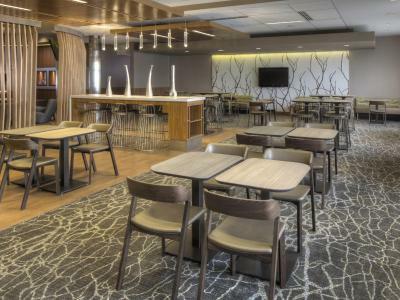 SpringHill Suites Anchorage is a 10-minute drive from Ted Stevens Anchorage International Airport. 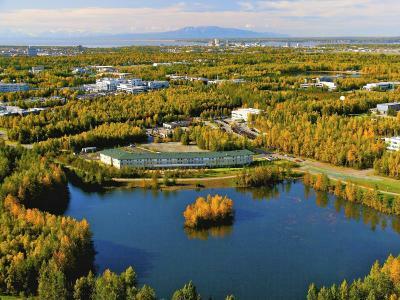 When would you like to stay at SpringHill Suites Anchorage University Lake? A TV and iPod docking station are featured in this room. 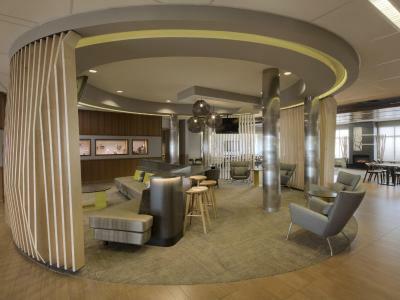 A seating area with a sofa bed is also included. This air-conditioned nonsmoking king studio features a living room/seating area, sofa bed, a small refrigerator and microwave. 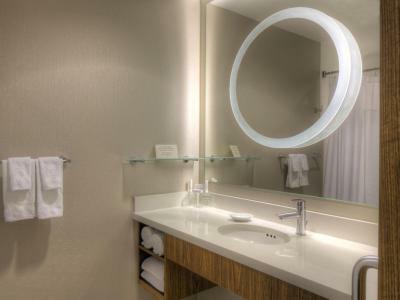 The private bathroom features a shower/tub combination, hairdryer, and toiletries. House Rules SpringHill Suites Anchorage University Lake takes special requests – add in the next step! SpringHill Suites Anchorage University Lake accepts these cards and reserves the right to temporarily hold an amount prior to arrival. Everything was pretty good. Had wonderful stay. The noise outside my room. There was kids staying in the nearby rooms that were running up and down the hallways. Sometimes late at night. Also need more washer and dryers. Lower. I've seen an old lady trying to throw her clothes into the dryer, not sure how she got it out, she was too short to even put the clothes in. The bed was very comfy! The shower temp was just right. The lighting was soft. I love the fire pit! Front desk gave is a late check out when we checked in. At 11, housekeeping knocked on the door and was very rude. She demanded to know why we weren’t out is the room and demanded to know when we would be out. We explained that we were granted a late check out of 1:30, which she seemed unhappy about. This has been our only negative experience at this property. This was NOT a “suite”- just one big room. We expected a separate room for the couch. The layout was awkward as the tv wasn’t visible from both beds. There was no table to sit at either. Disappointing. Pool run down or cracks from earthquake? No sign telling us if cracks were from quake. Breakfast was ok, ran out of towels for rooms and the pool area more than once. Beds were very nice, hotel was clean!! Reduced rates would be nice. A complementary ice water would be nice, in lobby. Close to town. Quiet area. Privacy was great. The lady checking us in...dark hair, impersonable but the young dark hair gentleman was more helpful. The lady for checkout was awesome.